This week at Less Is More the challenge is to Pick A Square, from the sketch provided. At firt this threw my mind, but then I looked at some new stamps, and decided what to do. This card has got to be the simplest I have ever made, it has been a long road to get to such cleanliness and simplicity. 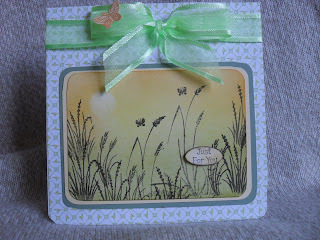 I am also entering this into the Secret Crafter Saturday Challenge No 136 Clean and Simple. 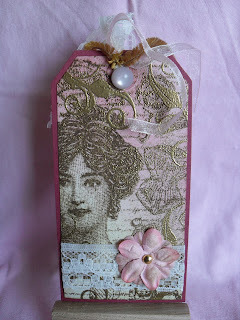 I used Paperartsy stamps from set Tops and Tails 3. 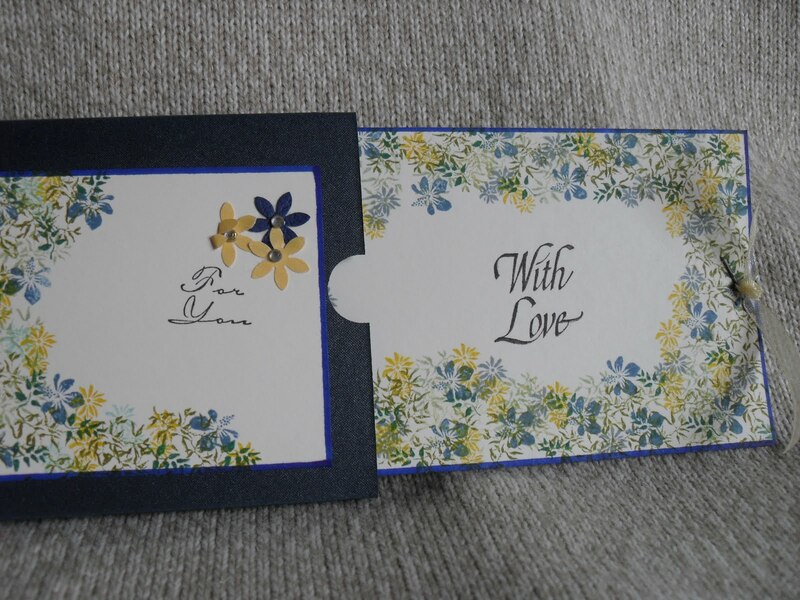 Stamped with Peeled Paint TH Distress ink Coloured with Sakura Gelly Roll Pens Yellow and Blue. 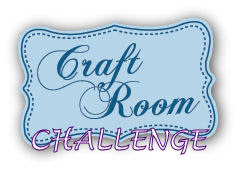 Over at Stampin' Royalty this week the challenge is a sketch, pop over to have a peek. 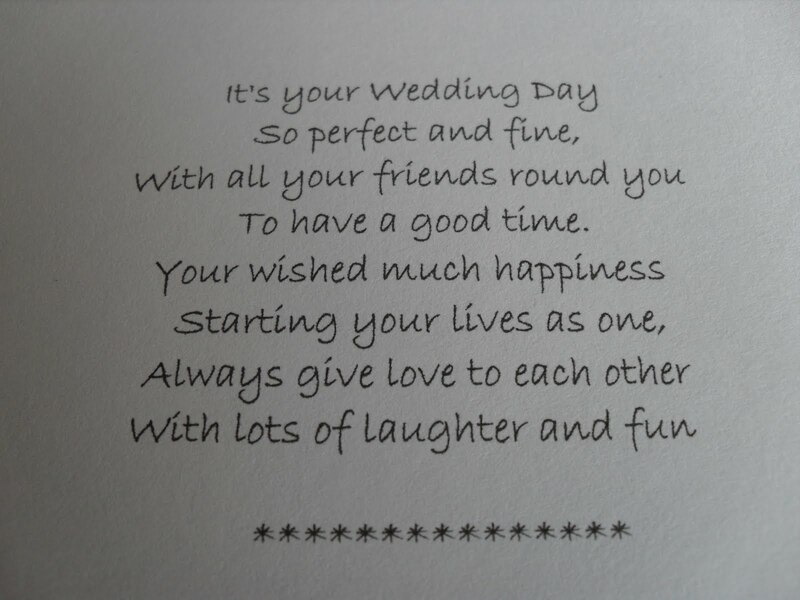 It's unusual for we Brits to make this type of tent fold card, so I thought I'd give it a go. 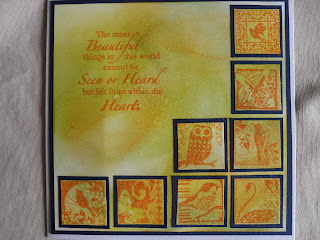 I used Mustard Seed, Peeled Paint and Spiced Marmalade to colour the stamping area. 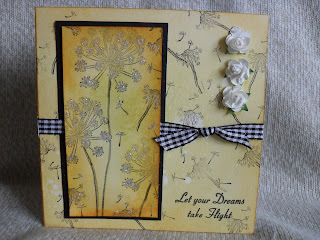 I used stamps from Wayside flowers by Stamps Away and Grasses by Inkylicious. The small orange butterfly has been added to hide a fault in the ribbon, but I just had touse it for it was the best match of ribbon I had. I used Mustard Seed, Spiced Marmalade and a little Peeled Paint to colour the card and panel. The stamps are from Across the Miles, an A4 plate from the Stampman, I splattered water to make the background more interesting. 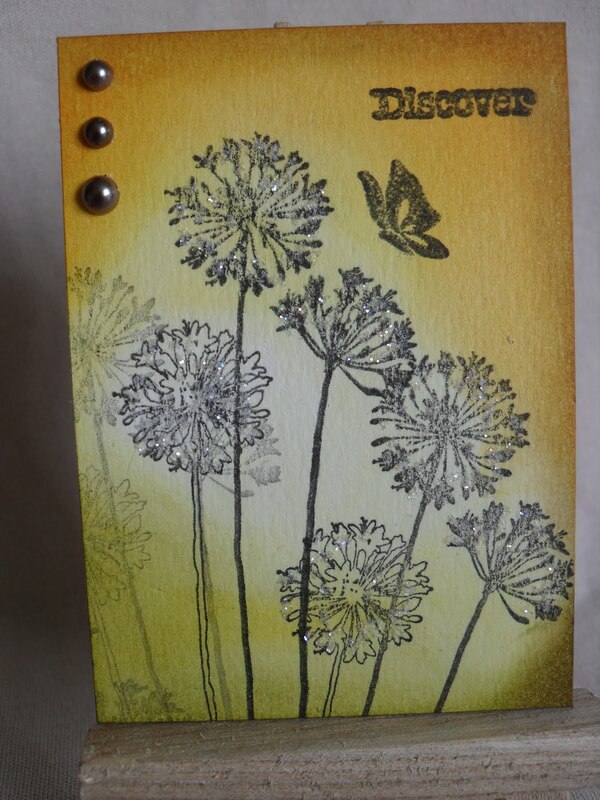 I used Diamond glitter glue on the dandelion to add a little sparkle, which shows better when you enlarge the photo. Good luck with your selections and with the development of a new challenge blog. . It is with saddness to ask any of the LIIU followers and challenge participants to pop over to LIIU before the middle of this week, which will be the final comment on the blog. Suzanne the owner, has announced the blog is to close, due to her ill health. Claire, her stalwart Senior Team member also felt unable to continue. I have been a member of the DT for several months and would like to thank Suzanne and the remaining members of the DT for their support during my term, short but sweet. 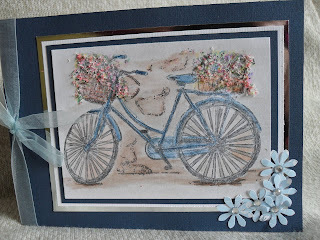 I have greatly enjoyed sharing the time with such a wonderful talented group of crafters and am grateful for the opportunity to have been on a such a splendid challenge blog. I wish Suzanne, Claire and all the DT members the best of luck, a return to good health and better times. 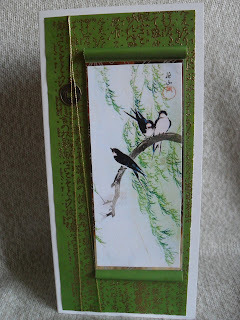 Wandering around blogland as I do, to add comments to the challenges, I have found another interesesting challenge blog called Crafty Anne's Challenge blog, this week is No 41 Oriental. 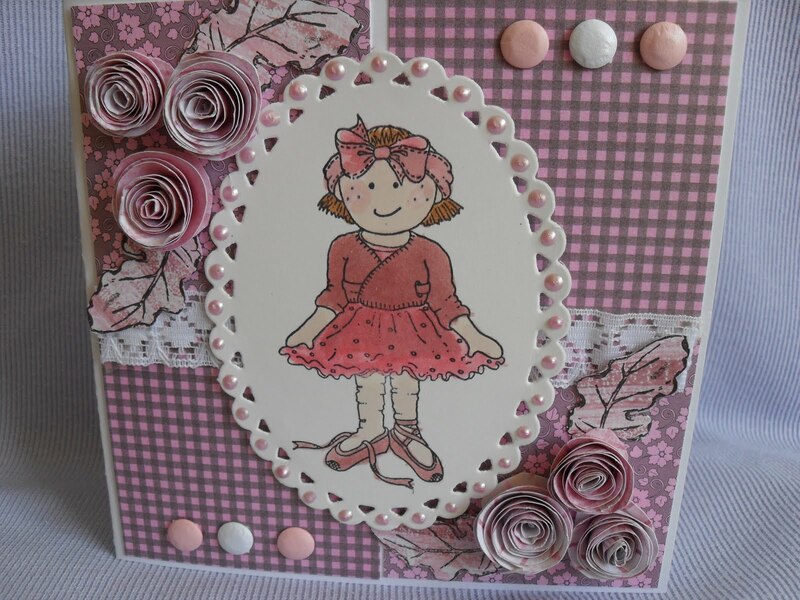 I need to make a Joanna Sheen card for a swap group I am member in. So, before I post it out, I thought I would add it to the challenge. The bird print, is from Oriental Dreams CD, which I have added to paper to look like a scroll. the background is again JS paper which I stamped with oriental kanji (writing) added gold E.P. and embossed, adding a gold coin to a piece of gold thread. 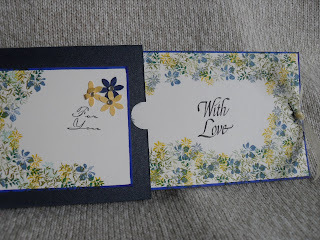 I'm not always able to get a card made for the very popular Less Is More challenge blog, but this week, I needed to practice with Parchment. This is only my second attempt, so not too bad, but I do know I need a lot more practice. Their theme this week is butterfly or buterflies. I just happened to be doing a butterfly and thought, yes, I'll enter this into the challenge. Papertake Weekly - Pale, Pretty Pastels. At Try It On Tuesdays, this week it is our Wild Card, which can be any creation a little different from the normal. We only have a few wild cards in a year for they are for when there are more than 4 Tuesdays in a month. 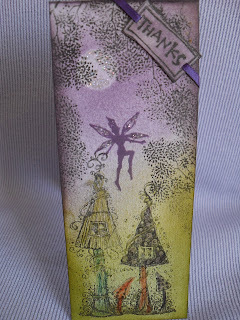 This month I chose Scraplings, thanks to Pat who discovered a blog giving super coverage of them here I made mine into a thank you card for a friend who loves fairyland. 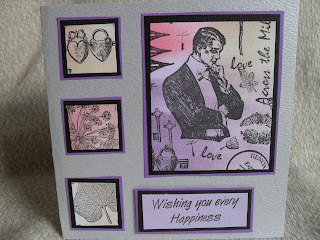 I used Distress inks to cover the background, stamped with a tree for the foilage around the edges with a stamp from Elusive Images, along with a couple of stamps from Lavinia. I always enjoy watching these scenes develop. Go on have some fun and see what you can make with scraplings, their uses are endless and just think your not wasting any card. Try something new is the idea of the Challenging Challenge, to challenge ourselves . Many will be surprised to see my chosen challenge, for I do NOT DO cute. The DT have been daring me to give cute a try, so I did. I didn’t feel any pain or discomfort making the card, for the blow was softened when I found a recently new make of cute stamps, with normal shaped heads and pretty faces. I apologise to those who have a deep affection for the alternative cute I refer to. 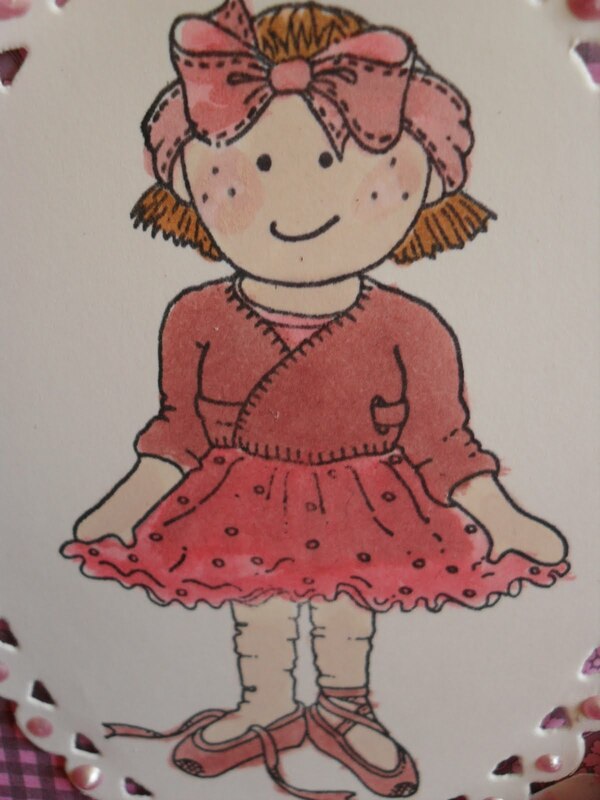 Molly Bloom stamps are fairly new, made in the UK, designed in the UK by Clare. I used paper from my craft stash, made the flowers and leaves, used some card candy to decorate. For the ballerina’s skin and hair I used Promarker’s . The remainder I used Distress Inks, as watercolours. Another new experience for me was to use a Pearl Pen, Wow! I am so impressed, the pearls do actually keep their shape, I will be buying more as soon as I can. There is a new Challenge Blog starting soon, which is currently asking for DT applicants. I have only just stumbled onto the blog, so my application to be considered is going to make it to the wire, just. I have an obsessive passion for creating crafty paper items. I try to experiment with different techniques, I don't know if I have a particular style or not, for one day I can get messy and dirty and another day, it's flowery and femine or next day, I will try to go all arty, because of this choosing 3 items has been difficult. Not because I am overjoyed with as many, but because trying to show a sample of my creations, maybe isn't so representative of my crafty work. I have added a tag, an inchie card with an inky background and a femine and floral large card. I wish everyone involved in the new blog lots of success, fun, enjoyment, which I will be happy to support. N. B. 25/5. I was not successful with my application, to join the DT. Thanks for the opportunity. Best wishes to the challenge blog and to all of the newly chosen DT members. 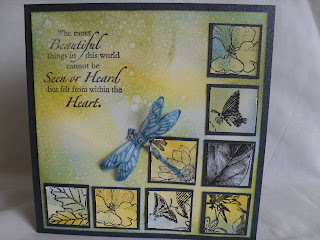 The challenge at Crafty Cardmaker's for two weeks is to create a project using embossing. 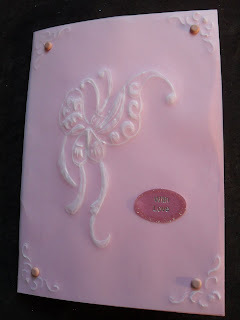 You can use any form of embossing. Be sure to pop over to see the varied and fabulous samples by the team. We are being sponsored this week by the marvellous Joanne Sheen so definetly worth you giving it a try. 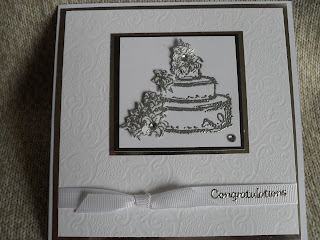 I love embossing, for any and all of the techniques can produce wonderful instant results. 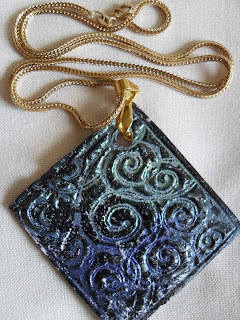 For this challenge I decided to make a deeply embossed pendant. I started with a 2" sq piece of mountboard, which I coloured all over, sides included with a black marker pen. I then heated 3 layers of UTEE (Ultra Thick Embossing Enamel). While the last layer was still hot and molten, I stamped onto it, with a rubber stamp I had previously covered in Versamark, to prevent it sticking. 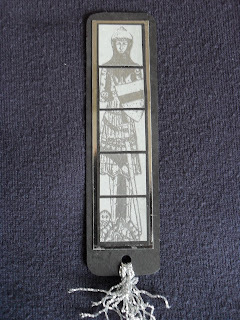 When it cooled, I removed the stamp, patted on more Versamark, then added two colours of mica powder using a small brush. I then patted it onto a wet wipe to add the moisture for the powders to be set. I finally added the jewelrey to complete the pendant. 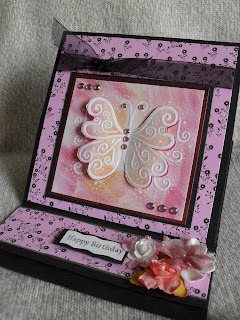 Full details of how I made this can be found on my tutorial blog. For the next two weeks at Let's Ink It Up - Challenge 15 - created by the B team, is for a crafted project to show a sentiment and a 3 -d flower. No other images are required. Please pop over and check out my team mates fabulous samples. 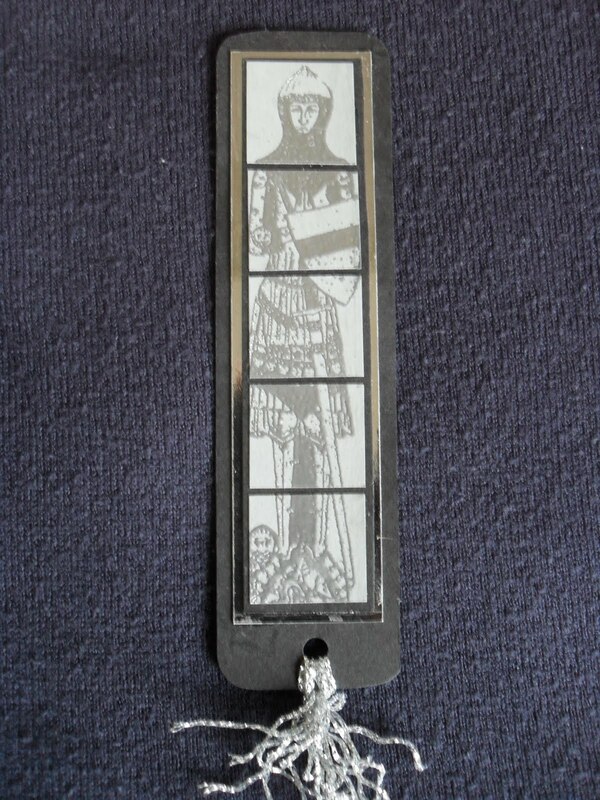 We also have a new sponsor with a wonderful prize, Kreativ Hobby I made a 5.75" sq. 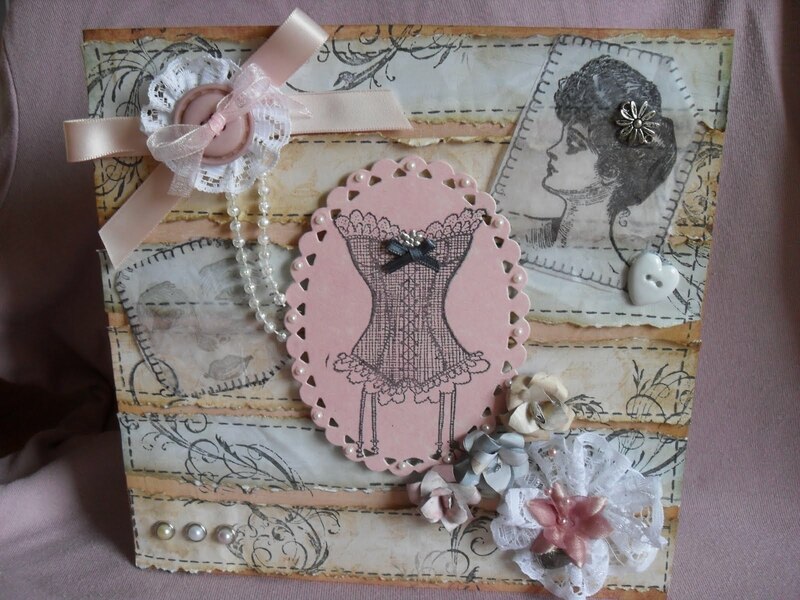 card, which I covered with a piece from Tim Holtz Vintage Shabby Paper Stash, I also made the spiral flowers from this paper stash. 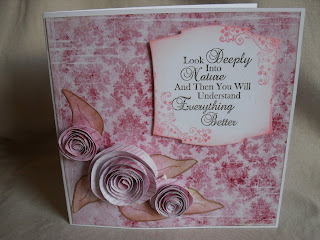 The sentiment is from a Sheena Douglass Little Bit Sketchy with Poppy and Daisy, stamped with an old corner stamp. The leaves are from a stamp in my stash which was a free gift many moons ago. I look forward to seeing your crafted works of art. 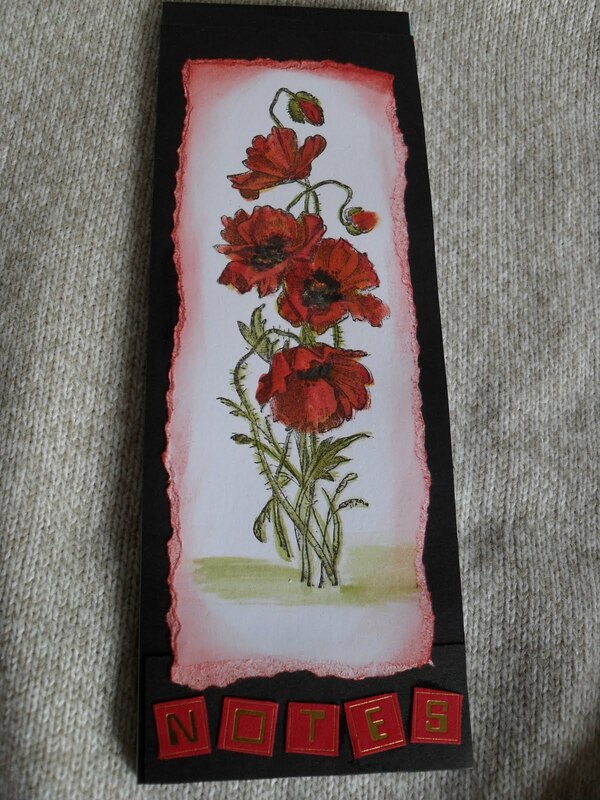 I hope you have fun making your 3d flowers for they are so popular at present. I have a tutorial on my Papercraft Tutorial blog on how to make the paper roses, which I hope will be helpful if your not sure on how to make them. 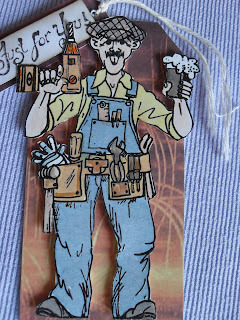 This week at Try It On Tuesday we would like you to make a TAG - the theme was chosen by Yvonne - One for the Boys. My OH's business and passion is fixing things, so this is very appropriate for any gift I may give him in the future. Lovin Ink are sponsoring us with a fab bag of goodies. My handyman is stamped with one of the Flippen men stamps by La Pashe. I used Promarkers to colour him in. Once again I look forward to visiting your blogs to see your tags. Thanks so much for the fabulous response to last week's challenge. Have fun everyone. 3 cards with various numbers of inchies being used, check the labels below on the right side bar. 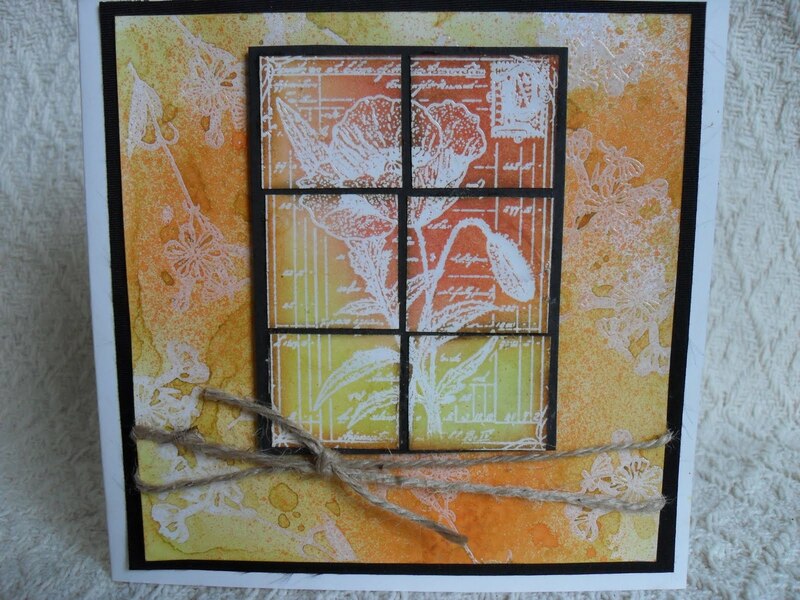 The card above has been coloured with Distress inks, Tumbled Glass, Mustard Seed and Peeled Paint. I sprayed the background card with water to achieve the effect. The inchies I cut from a previously prepared masterboard, which if you want more info go to here, then matted onto 3cm squares. 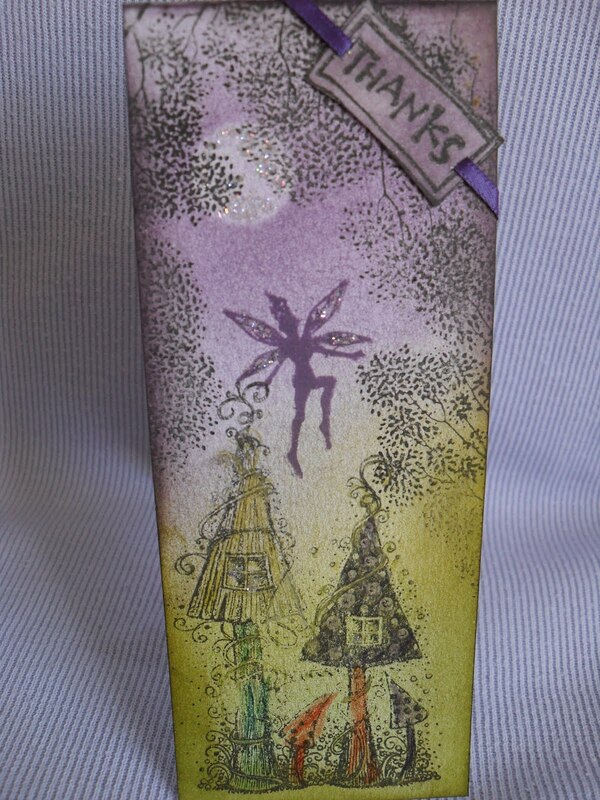 The bookmark below shows you can make more than cards, this is for one of my grandsons. I stamped and embossed with silver E.P. onto a grey card, matt and layered onto silver and black. The stamp is from Elusive Images. This week on Less Is More, the challenge is White on White. Before I even have any comments, I suspect I've not met the challenge. 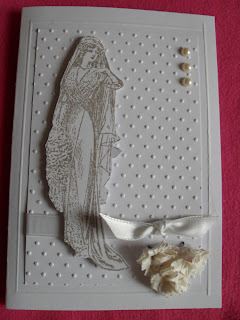 I so much wanted to use my new Edwardian Bride stamp from Bravura, so I had to use the lightest non colour I have which is DI Pumice Stone. The flowers and pearls are truthfully white, though as we all know, photos of white just don't do them justice. Thanks ladies, first excuse I've had to use my new stamp. The Stampman, for two weeks their challenge is Poppies. Janet, a lovely lady and friend, with her husband are planning a Poppyfest sale, you can read all about it, over on The Stampman, her blog, or on my blog to here. I have made a number of cards and gifts to deliver to Janet, so before some of them go to her, I am entering them into the challenge. 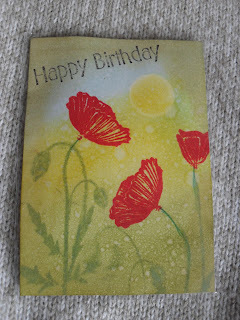 First this ATC, I used Lavinia poppy stamps and distress inks for all of the card. My second entry is this very reasonably (cheap) priced notebook, I altered the front, and stamped a La blanche poppy on the front. I hope you get lots of entries and maybe some generous donations, thanks to Stampman for supporting the appeal in this way. 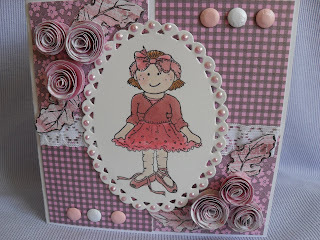 Stampin B's Design Team this week are requesting we play with some Flowersoft or Glitter. 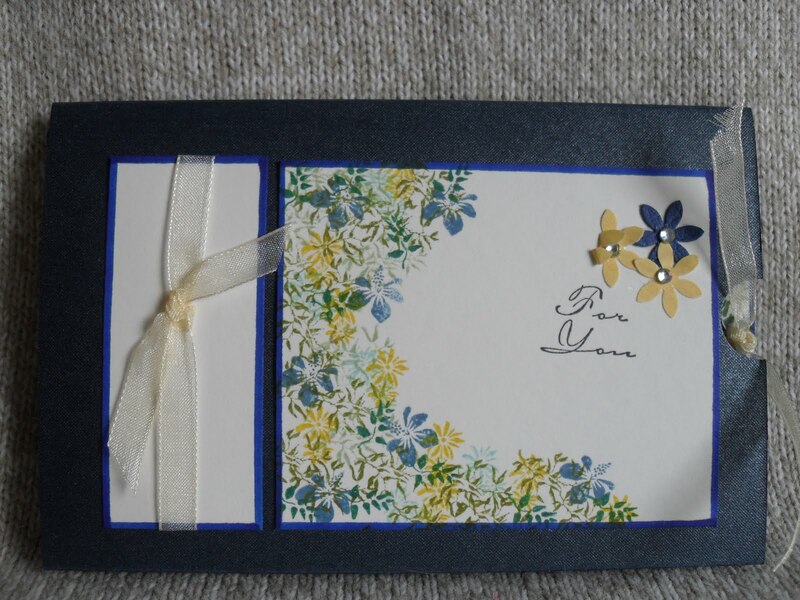 Now I think Flowersoft, for card making is something you either like or don't. Bing honest, I am not a lover, but , they are a North East company, so I should support them, I teach a class of ladies who like to use it, so I have a few boxes of the stuff and any chance I get to use it, for it does last for ages, I will grab the opportunity. The bike stamp is also from the same company, Flowersoft. 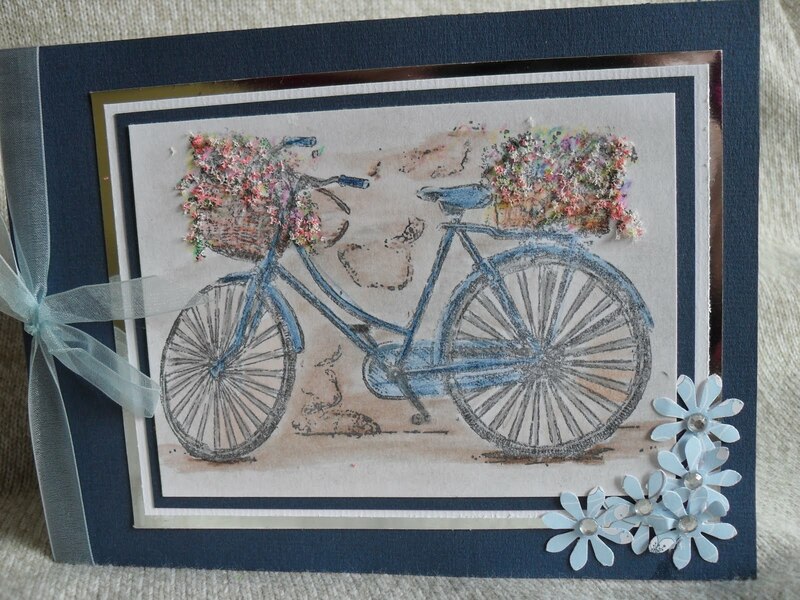 I actually love this stamp of the bicycle, I hope you do too. At ABC Challenges this week it is the letter T - Two Images or more is the challenge. 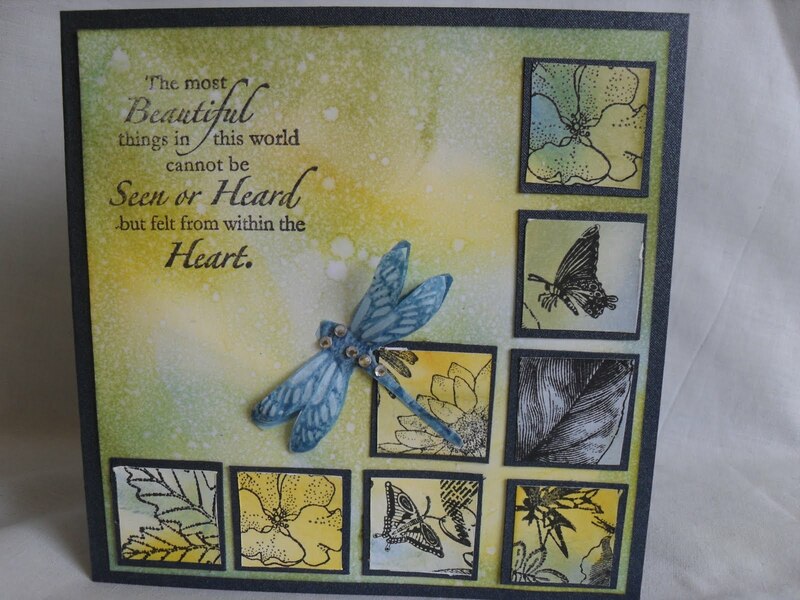 I made this card using stamps from Aspects of Design - Across the Miles from The Stampman. 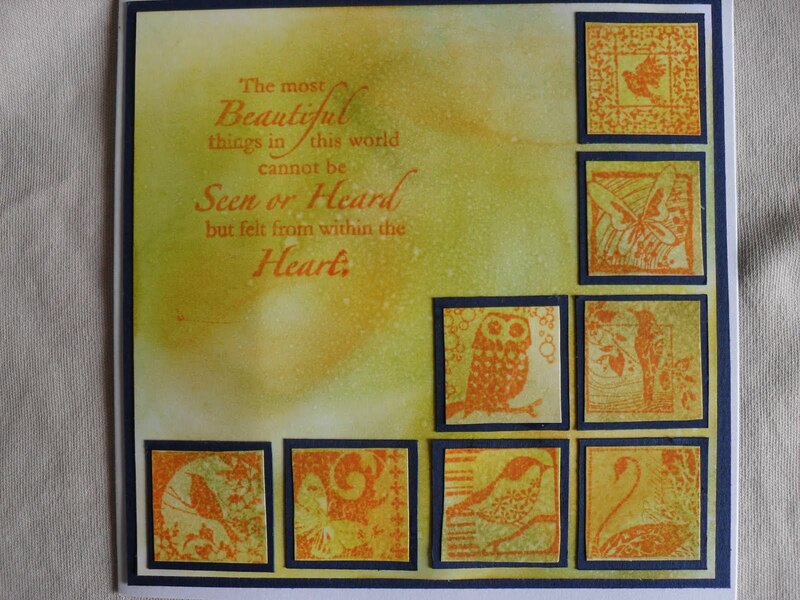 I made a masterboard of different stamps with a coloured background using several TH distress inks. I am really enjoying these inchies too. Thanks for the challenge. Say it with flowers is the theme at Oldie but a Goldie (stamp) this week. Here is a double slider, all done with the assistance of a free carrier bag. This set of tapestry stamps I've had for years, I love the versatility of them. 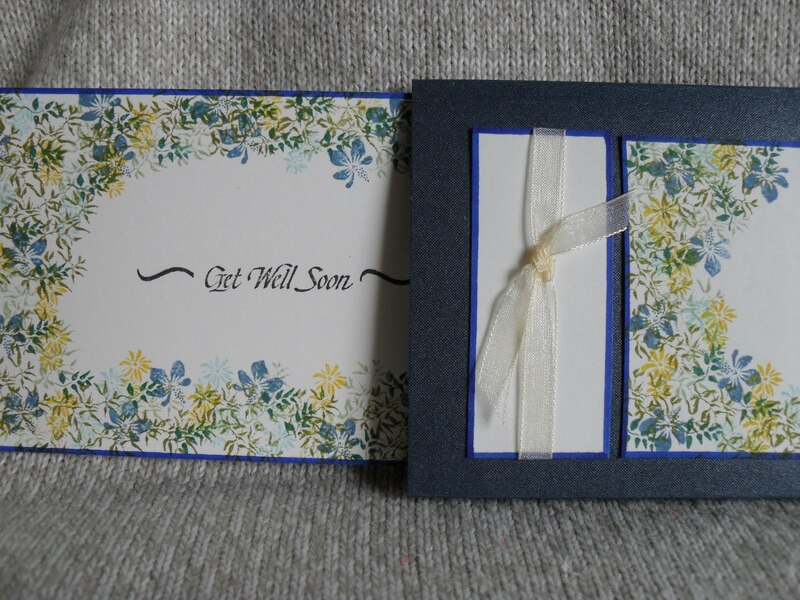 I made a get well card, hoping this will cheer up a friend, who is in hospital. As an ex-nurse it saddens me that many hospitals, no longer allow get well cards to be displayed within the bedside area. It seems ways of cheering the patient are no longer considered necessary. With this card, my friend can keep it in her bag and slide it open when she wants to look at the flowers, for she is also not allowed to have real flowers either. Sorry, I step down from my moaning podium. Labels: Easel card, Nellie Snellie die. 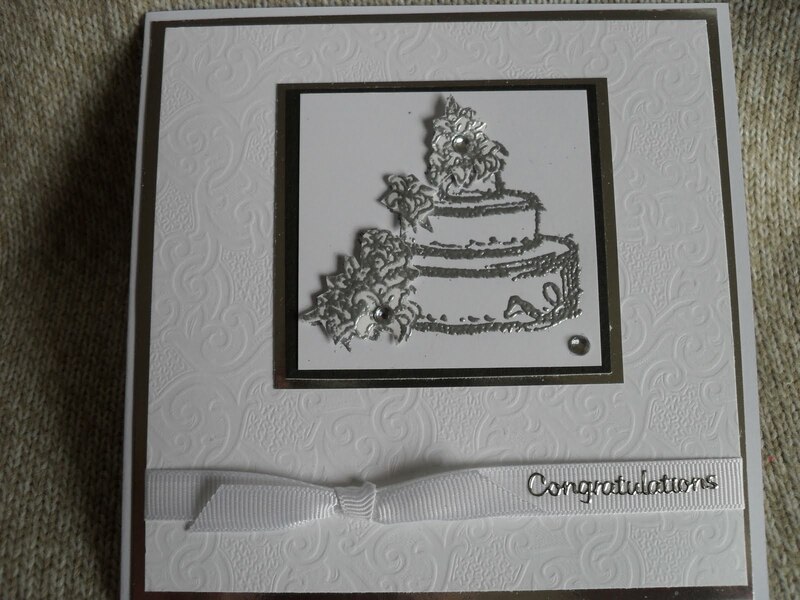 This week at Less Is More the challenge is for a card with either word, Thanks or Congratulations, I have decided on the latter, so I have a standby Wedding card. I used silver embossing powder for the wedding cake, plus I repeated stamping and embossing the flowers several times, cut them out to add several layers of decoupaged flowers. A few clear jewels added for some bling. Matted onto black and silver card. 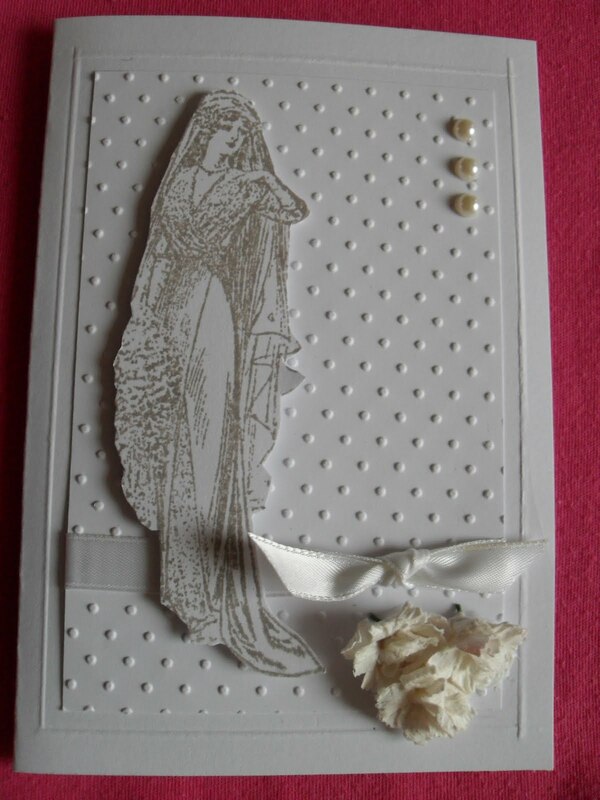 The embossed paper was bought ages ago, has been stroked with affection so many times, it is now time to actually use it. 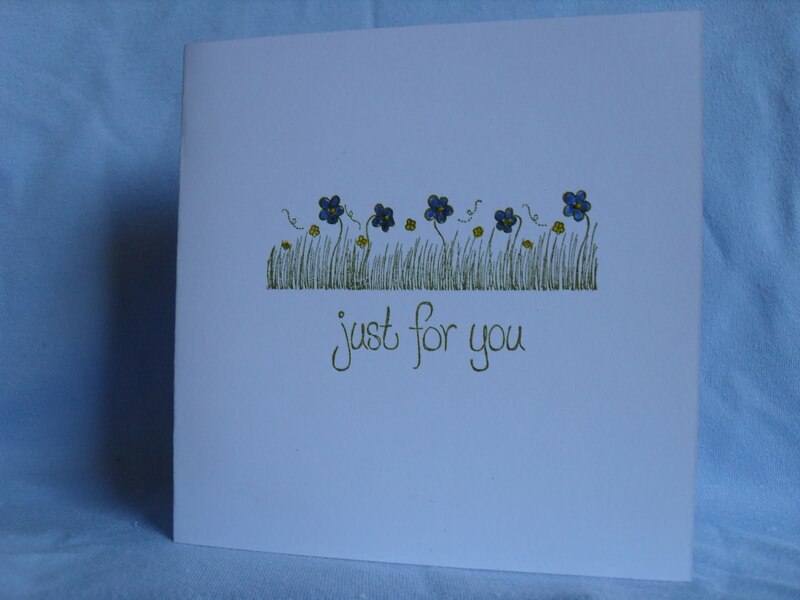 This was matted onto silver card onto the main white card. This is the verse I have added inside. The card measures 4.5" sq. Added white ribbon with a faux knot and yes that is a peel off. Sshh!! I couldn't stamp onto the Grosgrain ribbon. Pretty close to closing time but I made it. Phew! onto a piece of card larger than an A5. The inchies stamps from Inkadinkado set 23 Birds and Butterflies, cut into inchies, matted onto 3m sq of navy card, adhered onto the main body of the card. 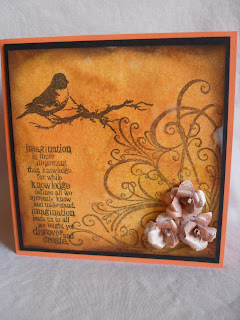 I used Wild Honey to stamp the images and the sentiment from Inkylicious. Thanks for the challenge ladies. 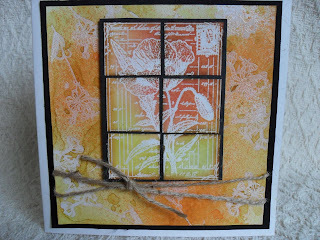 At last, a new challenge blog for ATCs, ATC Challenges. Well done girls, long overdue. 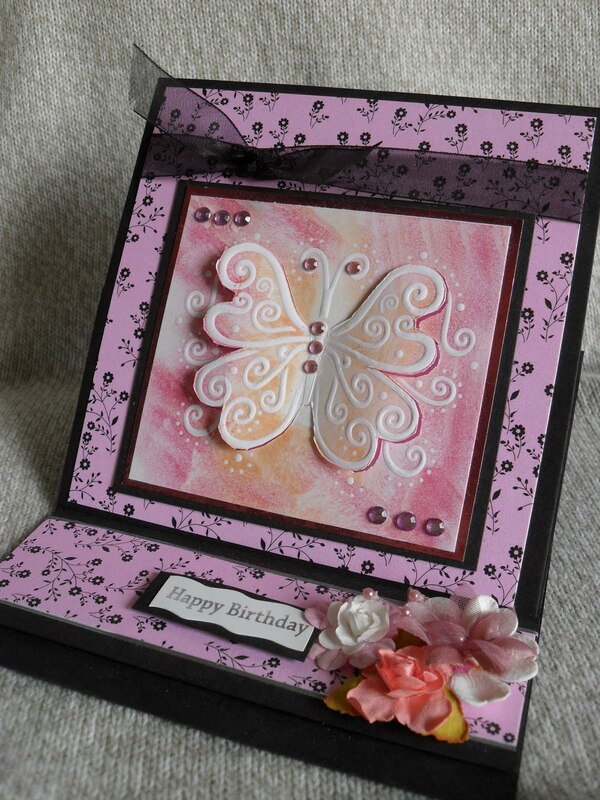 I've been an ATC enthusiast for probably 7 years, though being honest, I now have many shoeboxes and large files full of them, my interest is waning, but I still love making them, so I am thrilled this challenge blog is simply to make one ATC to meet a challenge, I can then pass it on either in a swap or send it to someone as an RAK - Random Act of Kindness. For the first challenge they have asked for Anything Goes. I used one of my favourite stamps, the Agapanthus from Stampendous, the butterfly and Discover are from an Inkadinkado set 23 Birds and Butterflies inchies. TH. Distress inks used - Wild Honey, Mustard Seed, Scattered Straw, Peeled Paint. Good Luck girls, I plan to follow you each week. I have added your logo to my blog, I will pass the word to my ATC friends. 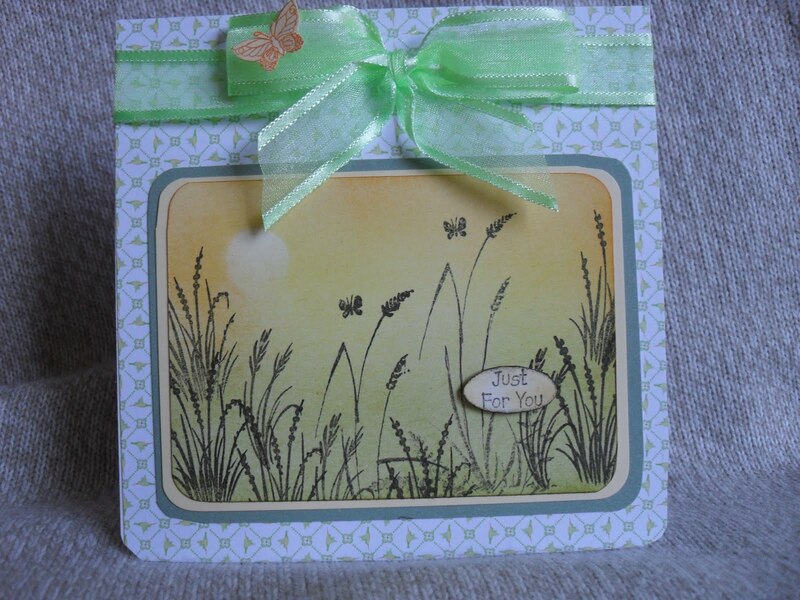 This week at Try It On Tuesdays, it is my choice of theme for a card. If and when my brain works it is sometimes out of the box. 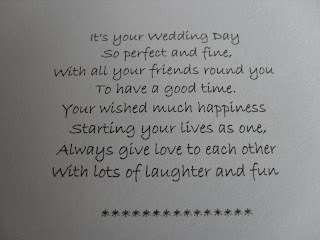 I thought we will be a little fed up of wedding cards, but I like the idea of Something New, less than 6 months, Something Old, more than 6 months. It can be anything you wish, in making a card, Paper, stamps, embellishments, ribbons, whatever you choose, but please tell us about it. I choose old and new stamps. the bird and quotation on the left are new, less than two months but the corner flourish and the flowers, made from a stamp, are older than 6 months. I used the splash, dip and splodge method to colour the background, with a final spray of Cosmic Shimmer Golden Fish. Walunt Stain was used to rub around the edges. Recipe -TH. Distress inks, Walnut Stain, Mustard Seed, Wild Honey, Spiced Marmalade. Stamps used. 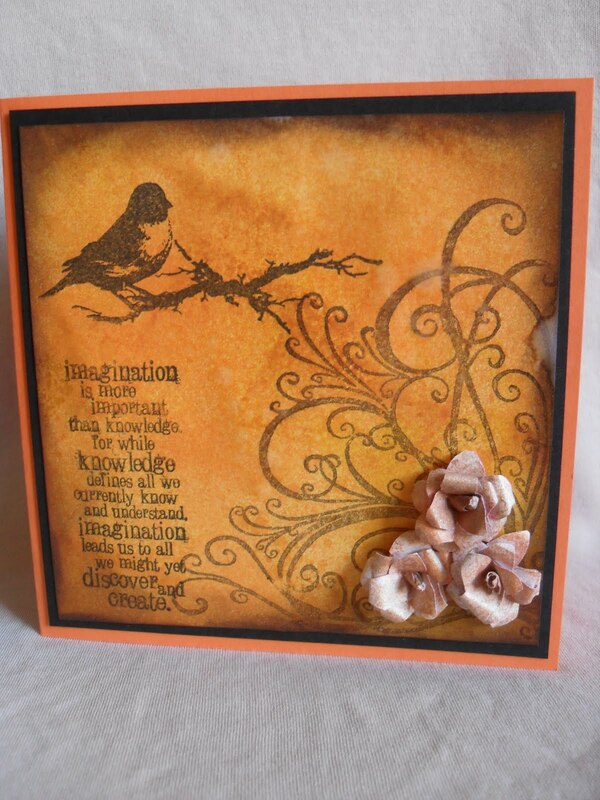 - Bird and Quotation - from EBay USA, Corner Flourish Sheena Douglass from Creative Expressions, the flower stamp from www.dreamees.org.uk We are once again on our card week being kindly sponsored by, One Craft Card Stop, their logo is in my side bar. I look forward to visiting your blogsto see your cards. Thanks.